Bali has a lot of unique and interesting buildings to see and visit, lounging and relaxing. But most buildings in Bali religious and cultural nuances. But there is one very unique mall money by building resembling terraced rice fields in Bali. In the area of ​​Kuta there is a mall artistic nuances of the island of Bali which is unique and distinctive. The building is Beachwalk Mall. Kuta Bali, Beachwalk Shopping Center in Jalan Pantai Kuta, Kuta, Badung regency, Bali. Precisely at Kuta Beach Bali. 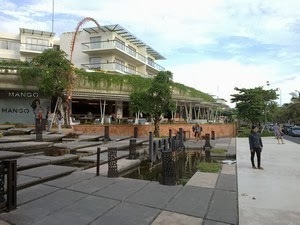 The mall is in operation since 2012, was built between Harris Resort Kuta Beach and the Sheraton Bali Kuta Resort, with an area of ​​3.7 hectares and extends up to 250 meters around Kuta Beach. Very spacious and meets the eye when viewed from across the street, from Kuta Beach Bali. 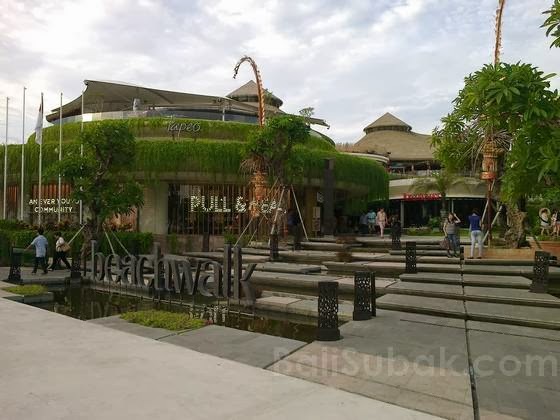 Building on Beachwalk Mall Kuta Bali looks very cool, and different from the malls in Bali. However modern architecture featuring a shape resembling terraced rice paddies. Building with greenery very much like the rice terraces. Beachwalk Kuta Bali also has a roof of straw. Artistic display of tropical shades, such as villas in Bali. Beachwalk Kuta Bali has a design with environmentally friendly concepts. No portion of the roof is made of straw. Recycled wood used material in the mall. Some floors in the roof made with wood. Impression of the art and environmentally friendly are felt while in this mall. Atmosphere at Beachwalt Kuta Bali looks beautiful with hanging plants installed around the building and the roof edge. The road is open in the mall has also been cool with fresh breeze of the beach. Thus reducing the use of air conditioning. On the second floor open area, there is an open park, so visitors can sit back and enjoy the sunset at Kuta Beach. If you want to see the scenery around while enjoying culinary, could also come to the cafe and restaurant which features a terrace overlooking the beach. In addition to enjoying the scenery, tourists can be satisfied shopping at Beachwalk. Various local and international brands here, such as Hugo Boss, ZARA, Victoria's Secret and LEGO. Fabrics by BIN House Museum with more than 600 antique fabrics from all over Indonesia, as well as boutiques contains works by well-known designers Bali also exist in this mall. Beachwalk Kuta Bali also has a cinema with the premiere studio has business class seats. For visitors who bring a child, can still be satisfied playing at the mall, because there is a special area for children and families on the third floor. Complete with playground and child care facilities. In order for a holiday in Bali more complete, Beachwalk features performances such as Balinese Dance and Kecak that can be seen without having to pay. There are also cultural activities batik paintings, sketches and much more that can be tried at Beachwalk. Beachwalk Kuta Bali is open daily, from 10:30 until 22:30. But on Friday and Saturday longer operational hours starting at 10:00 am until midnight.